The Royal Enfield 650 Twins are getting aftermarket upgrades as the motorcycles are being spotted with custom exhausts. We have already seen the Interceptor INT 650 get various options of aftermarket exhausts. The neo-classic bike shares its underpinnings and the engine with the cafe racer, and thus, any exhaust that fits the Interceptor INT 650 should also work on the Continental GT 650. 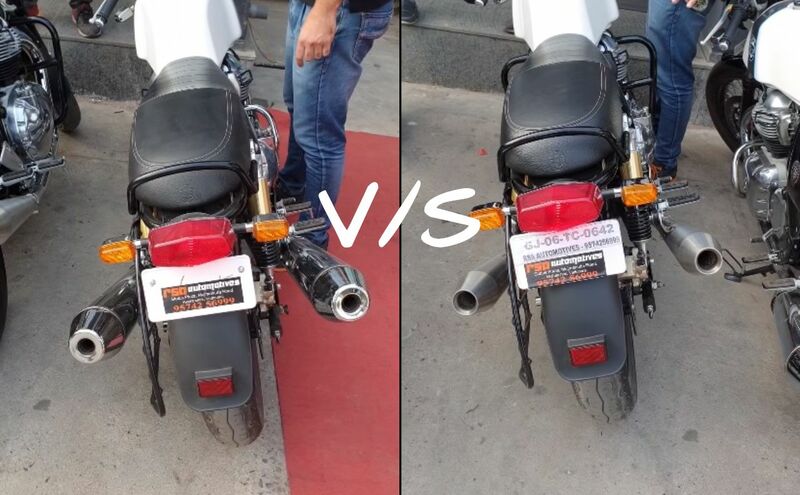 In latest updates, a Continental GT 650 owner has given his motorcycle an upgrade with an aftermarket exhaust. He has also captured the sound of the stock exhaust alongside the AEW performance unit on his Continental GT 650. The aftermarket exhaust cost him INR 18,000, and it adds a throaty note to the sound. While the Royal Enfield 650 Twins use a parallel-twin cylinder engine, the motor gets a single-piece forged counterbalanced crankshaft with 270-degree firing order. The setup provides a V-twin-like character to the exhaust note and minimizes vibrations. The aftermarket exhaust further enhances the sound of the motorcycle. For reference, the 648 cc parallel-twin, air-cooled engine delivers 47 bhp of maximum power at 7,250 rpm and 52 Nm of peak torque at 5,250 rpm. Royal Enfield offers S&S exhaust system as an optional accessory with the 650 Twins in the international markets. However, that exhaust is not available in the Indian market. Currently, Red Rooster Performance, Grid7 Customs, and AEW performance exhausts are the only options in the Indian market but getting them installed on your motorcycle could affect the warranty. A loud exhaust can also get you in trouble with the lawmakers and thus it is always a good idea to stick with manufacturer provided hardware. We recommend our readers to consult a Royal Enfield service centre before making any mechanical changes. The aftermarket exhaust, as seen in the video, has a throaty note. The AEW performance exhaust cost INR 18,000 and would fit both, the Interceptor INT 650 and Continental GT 650. Meanwhile, Royal Enfield is busy updating its portfolio to comply with the upcoming safety norms. The steep hike in prices due to increased insurance rates, ABS upgrade costs, and increasing competition are causing trouble to the brand as the company’s sales witnessed negative growth for three consecutive months. Sales in November fell by 6%, while December saw a 13% fall. Last month, the company reported negative numbers yet again as the sales stood at 70,872 units as against 76,205 units in January last year.